We love our summer seminars for the change to share dairy herd management strategies and to build connections with dairy farmers all over the world. This summer we hosted a particularly special seminar with a group of 23 young farmers from Taiwan. These young men and women are all second generation Dairy Farmers, who have already learned a lot about the industry from their parents. By participating in our ten-day seminar, they learned expert strategies to be able to take home to their family farms. We love seeing these inter-generational connections and the pride families take in their dairy farms. The focus of this seminar was dairy herd management in extreme conditions. 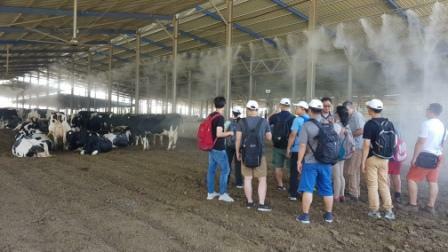 We covered topics such as lowering heat stress and implementing cooling strategies, and we visited dairy farms in Israel who showed these strategies in action. Other seminar topics including milking routines, udder health, nutrition, feeding management, data analysis, and more. These dedicated young farmers worked hard and left with a lot of knowledge! Of course, no Israeli Dairy School seminar would be complete without sightseeing trips around Israel. 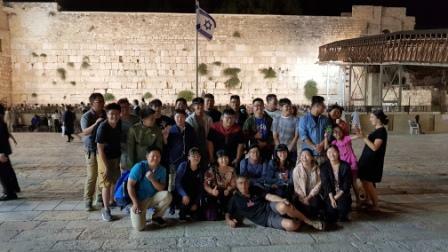 The group enjoyed trips to the Lake of Galilee, the historic sites of Jerusalem, and Tel Aviv, and Jaffa. We made sure to sample a wide variety of Israeli food throughout. The group’s favorite spots must have been the Hamat Gader hot springs and the Dead Sea. After all, humans need cooling when in extreme conditions too! The group had a fantastic time relaxing and swimming in both places. You can’t beat a nice float at the end of a productive day. We’re particularly grateful to Uni-President Enterprises, who arranged the trip. Partners such as these around the world help us to build international connections and improve dairy farming world-wide. We can’t wait to see what this group of young Taiwanese farmers will accomplish back at their home farms! Really amazing and well understanding development for animal and human needs.